Should everyone be avoiding gluten? Posted in Cooking & Nutrition on May 17, 2012. Last modified on April 02, 2019. Read disclaimer. Step into a grocery store or restaurant these days and you'll likely get a wide variety of "gluten-free" food choices. In fact, in 2010, gluten-free food sales reached an estimated $2.6 billion. What is gluten, who does it affect and is a gluten-free diet for everyone? As much as 1% of the U.S. population is affected by Celiac disease and there is no known cure. People with celiac disease will have to avoid gluten for the rest of their lives. In susceptible people, gluten triggers an autoimmune reaction that damages the small intestine while also preventing absorption of almost all nutrients. Over time, this can result in delayed growth and nutrient deficiencies, which in turn can lead to serious conditions such as anemia, osteoporosis, diabetes, autoimmune disease and even intestinal cancers. Since a person with celiac disease may or may not display symptoms, diagnosis involves blood tests and, in most cases, a bowel biopsy. Gluten sensitivity, or intolerance, is much more difficult to pinpoint. Some symptoms commonly associated with gluten sensitivity include abdominal pain, gas, bloating and headaches. However, more than 100 symptoms have been associated with gluten, and because no diagnostic tests exist, many doctors have dismissed patients' claims that their ailments may be linked to gluten. While experts agree that gluten sensitivity exists, they disagree on the prevalence of it. Some are also concerned at the growing hype surrounding the benefits of a gluten-free diet. They caution against turning gluten into a "diet villain" that is bad for most people. What is the difference between celiac disease and gluten allergy or "sensitivity?" Celiac Disease is not just a form of wheat or gluten allergy or sensitivity. It is a distinct autoimmune disorder triggered by eating gluten. The immune system's job is to rid the body of a foreign substance that might be harmful to it, such as bacteria or viruses. It also helps build immunity in case the same invaders try to attack again. The "immune response" is the process of getting rid of foreign substances and developing immunity. An allergic reaction is when the body's immunity to a foreign substance over-reacts so that it produces symptoms. The substance that triggers this reaction is called an allergen. The immune response can also malfunction and react incorrectly to the body's own normal tissues. It is like the system "thinks" that the part of the body is a foreign substance. The body is attacked as if it were a foreign invader. This is what happens in celiac disease, and it is triggered by the ingestion of gluten. In celiac disease, because of genetic predisposition, gluten stimulates the production of immunoglobulins that attack the villi lining the small intestine. Celiac disease is often confused for an allergic reaction because it requires a foreign substance (gluten) to trigger it. Also, in celiac disease a type of white blood cell called the T lymphocyte is activated along with other parts of the immune system. Untreated celiac disease puts patients at risk for other diseases such as osteoporosis and lymphoma. A gluten or wheat allergy (or sensitivity), by contrast, would not put patients at risk for long-term damage and intestinal disease such as gastrointestinal lymphomas. 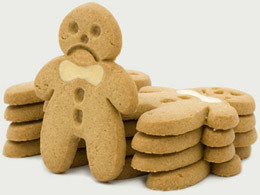 Generally, an allergy or "sensitivity" to wheat or gluten only results in temporary symptoms without long-term damage. The only very serious symptom of an allergy would be anaphalactic shock reaction. "Eating gluten-free is not meant to be a diet craze," says Rhonda Kane, a registered dietician and consumer safety officer at the U.S. Food and Drug Administration. "It's a medical necessity for those who have Celiac disease. There are no nutritional advantages for a person not sensitive to gluten to be on a gluten-free diet. Those who are not sensitive to gluten have more flexibility and can choose from a greater variety of foods to achieve a balanced diet." Experts do agree on one thing regarding a gluten-free diet: before going on one, get tested for Celiac disease. Lower amounts of gluten in the body can affect blood results, possibly masking the presence of Celiac disease. It is a serious condition, however, that should be monitored by a healthcare professional. + Add your comment for Should Everyone Avoid Gluten?